A: Thank you all for a lovely, warm welcome! I am sooo delighted to meet the criteria and pass the test to qualify as the new hostess of afternoon tea with Tea Party Girl. Yes, I am an Aussie and I can tell you I thoroughly enjoyed the two years that my husband, Tony, and I spent living in Atlanta GA, USA, working and living like a local. Traveling a bit and exploring a lot and loving our lives and friends over there! Back home here in Brisbane, Australia – now with 3 beautiful sons – nothing gets me through the day quite like a cup of tea, or two, or three…. Here’s a photo of me with my husband, Tony, and our three Boys Charlie, Max and Rhys (L-R), earlier this year. I haven’t always been, but for the past 12 months or so I have become almost exclusively a tea drinker, so I think it is curious that this new venture has presented itself to me now. Doesn’t life work in curious ways? Australia, just like the USA, is a large country, so I’m sure I can’t speak for all Australians, but taking tea in the typical circles I circulate in involves – tea bags and mugs! Occasionally a cup and saucer, but usually a mug. We’re usually all in such a hurry it’s a teabag and a mug – and if you’re at the home of a coffee drinker, it’s a coffee mug at that! At a coffee shop or café, a teapot and strainer and cup and saucer will be served (but the mug will be thick and clunky and not at all elegant, sob!). It hasn’t always been the case in my life … my Grandmother would serve ‘proper’ morning and afternoon tea, with fine china, a teapot and homemade date slice (I must see if I can get hold of that recipe from the family – it was delicious). 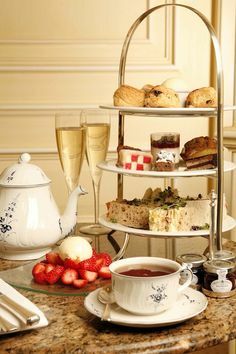 More recently, a very sophisticated and charming neighbor would serve an elegant afternoon tea, with delightful teacups, company and chatter. But everyone seems to be in such a hurry these days, and everything is done ‘on the run’. I’m on a mission to bring the experience of soul nurturing afternoon tea times back into our lives. Surrounded by friends and/or family and treated with small, delectable treats is what we need. Q:What part of Australia do you live in and can you tell us something about YOU? A: I’ve lived in a few parts of Australia in my time, but find myself happily settled in ‘rural-residential’ acreage suburbia in Brisbane, Queensland, Australia. With three growing and lively sons, we have the space to move here, and grow and be noisy and keep chickens and run with friends, get muddy, graze knees, laugh, love and live. “Tea for Two” in Australia : Two Rainbow Lorikeets having bread and honey on my back deck. Besides being a full time Mom and happy wife, I also love the internet and connecting with people with similar interests to myself through my computer! I love fresh, healthy food and looking after my health and the needs of my family. I love spending time with friends, caring for our animals, spending time at home and I always endeavor to make my interactions with others a positive experience. Q:What made you connect with “Tea Party Girl.com” ? A: My increasing interest in having a healthful lifestyle and excluding harmful and unnecessary ingredients from our bodies had led me to thinking more about what I consume – is this a dead giveaway for my age? – and a love for drinking tea and sharing a social ‘cuppa’ with special people in order to connect, and enjoy, made the opportunity to join Tea Party Girl literally “jump out” at me. There are so many aspects to enjoy about Tea Party Girl. The drinking of the tea for taste and refreshment, the gorgeous accompanying accessories (the ‘pretties’ – teapots, teacups, tea towels, trays, sandwich platters, table cloths…. ), the opportunity for friendship, sharing, connecting, the opportunity for charitable events and business endeavors. Tea is so easily interwoven with so many aspects of life! Q: What’s your favorite tea? A: Is anyone else like this? I seem to go through phases, where one month I will like one tea, another time I will prefer another tea. I also prefer different teas at different times of the day, before and after particular meals. At the moment, my overall favorite is peppermint herbal tea. It is soooo very refreshing! Q: What’s your favorite afternoon tea food? Q: I know you have big plans for this site and for connecting with the readers. Can you share just a few things we can all look forward to? A: Where to start? 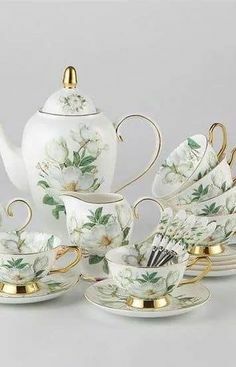 I can’t decide if exploring the stunning array of tea cups, teapots and afternoon tea accessories out there should be first, or, perhaps an exploration of just how many different types of tea that are available to us to enjoy. Then again, the health benefits of tea are incredibly important to appreciate, so that will be a high priority. The business of tea is an attractive and lucrative one to be in, so exploring further details of how this can be realized is on my list – and I’ll be asking you, Dawnya, to assist me here with your vast experience and knowledge of this area! Fundraising for charitable causes is also of interest to me, and I imagine will be of interest to some readers, so I will be reporting on some ideas there. In September, a “High Tea” is being held at a local ‘Bush Garden’ in my suburb and I will be attending to enjoy the experience, review the event and talk with the hostess about the proceedings. I will also be visiting some local tea rooms (in comparison with coffee shops, they are few and far between, here, I can tell you!) I have just recently learned about, to report how those businesses attend their customers and what really makes them “tick”. Have you ever heard of “Billy Tea”? Well! That is an Aussie “experience” and a half. I won’t call it a tradition, but it’s from folklore in this country and something to be experienced at least once! If you like tea out of an enamel mug, with bits of ash from the open fire in it, and campfire smoke in your hair while you’re drinking it, you’ll love it! Q: Where can the readers connect with you? A: Since I’m nearly always connected to my computer, I’ll be close by if you post or send a message on Facebook or via contacttpg@gmail.com or the Contact Us page on teapartygirl.com And on that note I warmly invite you to reach out and let me know your thoughts and wishes and requests for posts, information, solutions, recipes and topics for future blog posts. I want to thank you, beautiful Dawnya, for entrusting your much-loved Tea Party Girl blog to me, and thank you readers, for the opportunity to serve you and be in your lives. Well ladies and gentleman. I know I leave you in great hands and don’t worry, Sonya Michelle and I plan to work together from time to time. I still have a contribution or two to make to the world of afternoon tea. I have enjoyed Tea Party Girl and look forward to many exciting exciting times with you. and spreads] I will keep trying. I guess my favorite tea is Earl Grey but I too am into peppermint tea. I collect tea pots and have 52 now but my favorite for personal use is a Brown Betty. OH my, Ruth! 52 teapots – that’s wonderful! You have one for every week of the year! I think I should also send out the question – who has the most teapots in their collection LOL! Lovely to hear from you – thanks for saying hi! Welcome to Tea Party Girl, Sonya Michelle! As an American, obsessive tea drinker with an Aussie tea drinking husband, I particularly am looking forward to your perspective! I would love to see your recipes for healthy tea treats; as we’re focusing on healthier eating too! So great to hear from you and thank you! My difficulty at the moment is deciding WHICH healthy tea treat to deliver first! I am so very glad to hear that Lady Dawnya has found someone equally passionate to pass the Tea Party Girl torch to! Dawnya has been instrumental in the tea world, and will be greatly missed. Her “Star A Tea Business” course helped me immensely in starting my own “By Reservation Only” tearoom in a historic Victorian home! I’m encouraged to hear that she is planning on contributing from time to time. Lady Sonya, you sound like you will bring a fresh direction to the Tea Party Girl blog. I sincerely look forward to following you! So lovely of you to give such a warm welcome. Dawnya and I are in contact and you will hear from her from time to time!